Cut the Corvina in dices and season. In a pan, with a bit of olive oil, slightly fry the corvina dices and keep aside. Clean the artichokes by eliminating the external leaves and the upper part and cut them in wedges. Fry them, together with the previously chopped onion and, when they start getting some color, pour the white wine and allow it to reduce. Add up a tablespoon of flour, stir and add the fish broth. Cook for 15 minutes at medium heat, incorporate the Corvina and cook for an additional 5 minutes. Afterwards, toss in the clams and, once opened, separate the meat from the shell. 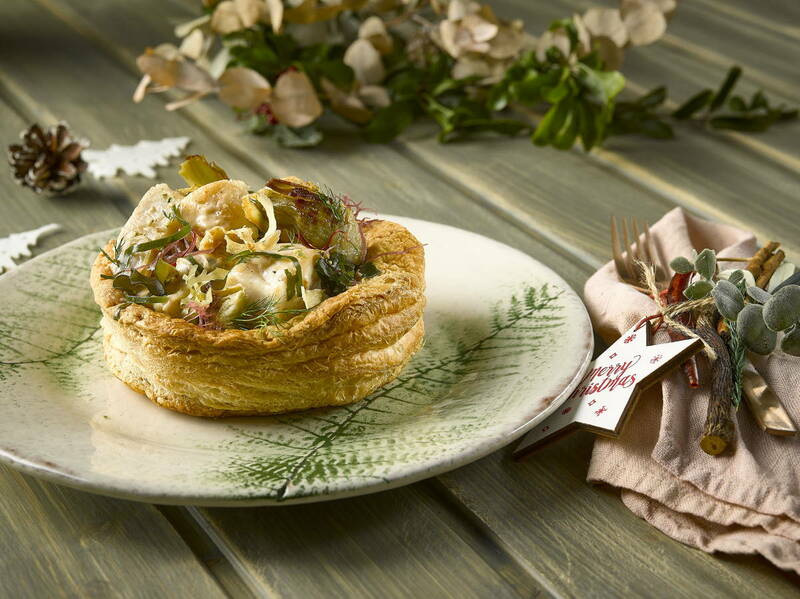 Set aside, season to taste and stuff the vol-au-vent previously heated on the oven for a few minutes. With the help of a peeler, make parsnip strips and fry them in oil at medium temperature until they are slightly golden. Drip them in paper towel and decorate the vol-au-vent with the strips, the hydrated algae and a bit of dill.